Bradley Beach Mayor Gary Englestad swears in new police officer, Andrew Redmond. COASTER photo. 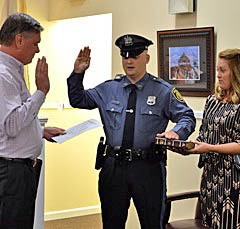 Bradley Beach welcomed new police officer Andrew Redmond to the department this week. Mayor Gary Engelstad administered the Oath of Office to Redmond at the Borough Council meeting. In other business, Harvey Rosenberg, speaking for a subcommitte, discussed the current time limitations on parking on Main Street. He said the limitations deter retail traffic. The mayor asked the subcommittee to address the full issue of parking and come back in 90 days with a recommendation for parking changes. The borough will also ask for recommendations from the Chamber of Commerce, Police Department, Council, Zoning and Planning Board, Quality of Life and the Main Street residents. The subcommittee also asked the Council to review the ordinances for enforcement of construction hours in the borough. Rosenberg said that the subcommittee suggested that construction be limited to a half-day on Saturday and no construction on Sunday. Councilman Thomas Volante disagreed saying that the current ordinance works for the borough. Construction can be performed till 6 p.m.on Saturday and is banned on Sunday. In addition, the council also discussed the purchase of an ID system that would provide badges for borough employees, volunteers and vendors. The approximate cost would be $5,000. “I have no problem with giving badges to employees, but I don’t want to get beyond the scope of the borough. The council will meet again on Tuesday, July 8 at 6:30 p.m.